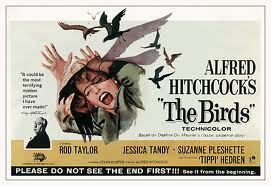 Today is the 48th Anniversary of the Release of Alfred Hitchocock's The Birds. I'm particularly fond of the movie... well the setting, if not the film itself, since I have a home in Bodega Bay where most of the film takes place! Bodega Bay on the Northern California Coast (Sonoma County) truly is filled with birds, flocks of them... not that any have actually attacked me. They do roost on my roof and make a mess, but that's a different story..it's not blood! I also did a murder mystery party in the "School House" which is actually located in the town of Bodega, about 5 miles inland from Bodega Bay. Hitchcock's film The Birds was loosely adapted by novelist Evan Hunter (aka Ed McBain) from the novella by Daphne du Maurier. Hunter took the job after reading du Maurier's story. Hitchcock then promptly told him to forget everything he had just read, all the director was interested in was the title and the idea of birds attacking people. Well, you know how that is in the movie business. The only Academy Award nomination that The Birds received was for Best Special Visual Effects for Ub Iwerks' animation: more than 350 special effects shots. Every year Tippy Hedren comes to Bodega Bay to sign autographs at the Tides Wharf. Very fun. Hitchcock put Bodega Bay on the map, but in truth, that map is a bit dusty now and Bodega Bay remains a sleepy little town on the coast... with a lot of birds.